It is the unanimous opinion of all those who have visited the Osa Peninsula that it is by far the most beautiful part of Costa Rica — the country’s best kept secret! It is certainly the most remote and least spoilt area of the country, and over one third of its pristine beauty is protected by Corcovado, the crown jewels of Costa Rica’s National Parks. The Osa has no paved roads, no resort hotels and condominiums – it still feels wild and exciting, and beckons to be explored! Located in the south west of Costa Rica, the Osa Peninsula is one of the most remote, most spectacular and wildest regions in the country. It is one of the last places in Costa Rica to be settled – it is only within the last 10 years that it has had road access – and consequently much of the Peninsula is still covered in majestic, pristine rainforest. At least half of the Osa’s extensive tracts of rainforest and swamps are protected by Corcovado National Park, and Private Reserves. Its forests are home to endangered species such as Baird’s tapir, the white-lipped peccary, the jaguars the America crocodiles, and the harpy eagle (only recently been re-sighted). It boasts the largest population of the endangered scarlet macaws in the country, and is the center of the very restricted distribution of the endangered Central American squirrel monkey. This small peninsula is host to almost half of Costa Rica’s 860 species of birds (that is almost 5% of the world’s species! ), 140 species of mammals, and 117 species of reptiles and amphibians. Almost 750 species of trees have been catalogued in the area, more trees than in all of the North temperate regions of the world combined. Impressive credentials indeed! Per unit area, the Osa Peninsula holds possibly the highest natural diversity on earth. The National Geographic magazine described the Osa Peninsula as “the most biologically intense place on earth”. This description is a reference to the incredible abundance of wildlife on the Osa Peninsula -not only in it’s rainforests, but in it’s surrounding marine environment as well. Botanically, the Osa Peninsula has strong affinities with that of the Amazon and Orinoco basins, and its unique forests contain more endemic plants and animals than in any other area of Central America. Climatically, the Osa is the wettest place on the Pacific coast of Costa Rica, receiving up to 7 meters of rain annually. Some of the Osa Peninsula’s landmarks are described below. Established in 1975 and extended in 1980, this 43.735-hectare Park encompasses 13 major ecosystems, ranging from sea level to 745 metres. Its rainforests are by far the most exuberant in Central America, and its trees are comparable in grandeur to the best that the Amazon Basin and the South East Asian forests have to offer. Indeed, Corcovado Park holds the largest tree in Central America, a giant Silk Cotton tree (Ceiba pentandra) that is 77 metres tall. The Park embraces the largest remaining tract of Pacific Tropical Wet Forest in Central America. Corcovado is patrolled from six ranger stations, four of which host visitors to the Park: La Leona on the southern coastal boundary of the Park; San Pedrillo on the northern coastal boundary; Los Patos to the east. La Sirena is the largest Rangers Station and is the nucleus of Corcovado. Located 16.5 kilometres of the western coast of the Osa Peninsula, Caño Island is 300 hectares in area with 5,800 hectares of Sea included in the Reserve. While the Island itself is home to relatively few animals and plants, its surrounding waters abound with marine life: colourful reef fish, impressive schools of large pelagic fish, manta rays, sharks, turtles, whales and dolphins. Caño Island is second only to Coco Island in the quality of its diving in Costa Rica. Historically, Caño Island was the sacred burial ground of the Boruca Indians, and many artefacts, including stone spheres, are testimony to this pre-Columbian past. The Rio Sierpe and its watershed, the Dequis Valley, isolate the Osa Peninsula from the mainland. This substantial river is unusual in that it is tidal almost up to its source, the Sierpe Lagoon. The Rio Sierpe is roughly divisible into two wetland areas: the flooded forests of the upper Rio Sierpe basin, and the extensive mangrove swamps of its delta. The upper Rio Sierpe wetland is virtually uninhabited, relatively unspoiled and it contains large areas of raffia palm swamp, flooded forest and lagoons. Fingers of high ground, thickly clad in rainforest, permeate this area. This wetland basin is home to some large crocodiles! The delta of the Rio Sierpe, which it shares with the Rio Terraba, is the most extensive area of mangrove swamp in Costa Rica (almost 50% of all the mangrove wetland of the country). This swamp is permeated by a maze of channels in which it is easy to become lost! On the coastal fringe of this delta, near the mouth of the Rio Sierpe, lies Violin Island. Sir Francis Drake reputedly buried a large treasure here. The many attempts to find this treasure have met with no success. However, Violin Island has yielded many gold nuggets of one or more kilos in weight. The Osa Peninsula encloses a tranquil body of water called the Golfo Dulce. Its sparsely inhabited coastline boasts incredible scenery with deserted sandy coves, mangrove deltas and rocky bluffs densely clad in pristine rainforest. The Gulf teams with marine life- fish, turtles, whales and dolphins, and the fishing here is excellent. In places the Golfo Dulce is up to 600 meters deep, but it also has several shallow reefs and deserted islands. Drake Bay and the rugged northern coast of the Peninsula can have changed little since the intrepid English mariner, Sir Francis Drake, visited this area in search of Spanish gold over 400 years ago. The presence of the small Pueblo of Drake and the numerous jungle lodges along its coasts have had little impact on the impressive forests, secluded beaches and breathtaking scenery of the area. Drake Bay, Caño Island and the northern Osa are accessed from Palmar Norte, a large market town on the Pan-American Highway at the base of the Peninsula. The town receives regular bus services and scheduled flights from San Jose. From Palmar one must travel by taxi or bus through banana and oil palm plantations to the village of Sierpe. From there one must then travel by boat down the Rio Sierpe, through its mangrove delta, to Drake Bay and beyond. Carate, meaning “jock hitch” in the local lingo, is the southern gateway to the Corcovado Park. It is where the dirt road from Puerto Jimenez, that skirts the Southern end of the Peninsula, ends. Carate is truly the “boonies”! Opened up originally by gold miners, Carate has only recently seen the development of a few, exclusive jungle lodges. Its unspoiled forests abound with wildlife, and the extensive, deserted Carate Beach is an important nesting site for turtles. Two large lagoons nearby team with fish, caiman, crocodiles and wadding birds. A few local gold miners still pan for gold in the Rio Carate. Carate’s small airstrip takes chartered flights by light aircraft. 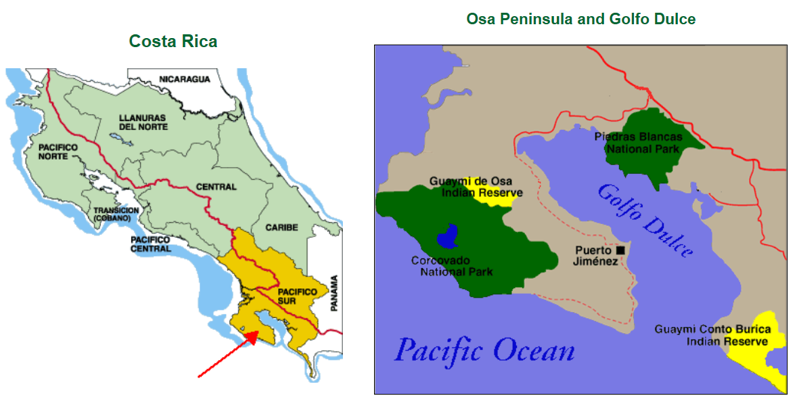 The Osa holds substantial gold reserves, and Puerto Jimenez grew up in the hay-day of the gold rush to the Peninsula. It was truly a “wild-west” town, once boasting 27 bars and three whorehouses. Today the emphasis is on tourism, the whorehouses and all but a few of the bars have gone. Situated on the shores of the Golfo Dulce, Puerto Jimenez is now an enchanting little town, whose easy-going, friendly inhabitants give this pueblo a unique charm. Puerto Jimenez is the entry point to the centre and south of the Osa Peninsula and Corcovado Park. It receives two scheduled flights a day and a regular bus service from San Jose ( the longest bus journey in Costa Rica!). There is also a daily passenger ferry service from Golfito, a port town on the mainland side of the Golfo Dulce.